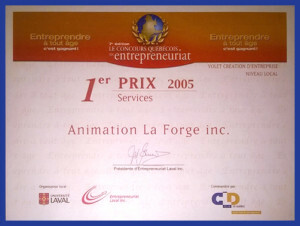 Animation La Forge inc. officially opened its doors and started activities in 2004, however the beginning of its development dates back to 2002 when Virginia Gobeil, François Moffet and Eric Dugal, three daycare educators, decided to use foam swords used in life-size games to create a new concept. Indeed, their experience in the field of education and in leading large group games allowed them to invent a complete sports system to get young people moving in a safe setting. The Katag equipment and game were tried and tested for two years with the target audience at the Saint-Jean-Baptiste School in Quebec City (La Capitale School Board) and the L’Escale and Plateau School in Charlesbourg (Premières-Seigneuries School Board). In early 2004, the company registered as a partnership, participated in Laval University’s Quebec Entrepreneurship Contest and was awarded a ‘Jury Mention’, which was the impetus to break into the educational-activities industry. In September 2004, the partnership became a company and began to promote its services and to obtain its first contracts. In November of the same year, we participated in the School Daycare Services Symposium in Montreal. 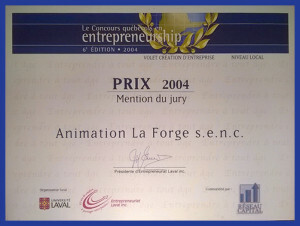 In March 2005, Animation La Forge won First Prize in its category at Laval University’s Québec Entrepreneurship Contest. 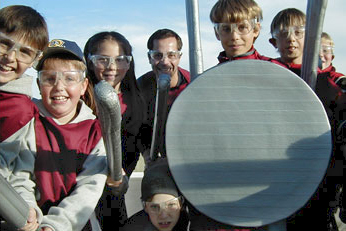 In April 2005, the company participated in the Quebec Child Care Symposium, and in June 2005, the Charlesbourg Express newspaper highlighted us on the front page with a feature article. To date, Animation La Forge inc. has visited over 700 primary schools in Quebec, day camps, several recreational organizations and also hosted birthday parties and family activities. The company has also participated in major events such as the Capital School Board’s Convocation (May 2005, 2006 and 2007), the Quebec Winter Carnival (February 2006 and 2007), Drummondville’s Community Center Convention (August 2006) and most recently, Quebec City’s 400th Anniversary celebrations (an activity for 400 people, children and parents, on the Plains of Abraham in July 2008). These events allowed Animation La Forge inc. to test its activity with groups of 150, 200 and even up to 500 participants at a time. The company continued to evolve and develop in Quebec City while simultaneously opening its doors in Montreal in September 2005. The service area now extends to a 300-kilometer radius from these two service points but we also go further: for example, KATAG was promoted in Canmore, in the Rocky Mountains of Alberta, on two occasions at the Canmore Children’s Festival (2007 and 2008). Animation La Forge inc. now has a strong team of skilled facilitators, using as many as ten people in the preparation and maintenance of safe and reliable equipment. The positive response of children and adults from different environments indicates that our concept can engage everyone, regardless of areas of interest. We believe in encouraging people of all ages to engage in physical activity in a safe and stimulating environment. We hope to visit you soon!